Nestled in a pretty wooded valley in the Auxois region, near Montbard, come and visit the château de Bussy-Rabutin and the surprising portrait gallery created by a disgraced courtier of King Louis XIV. 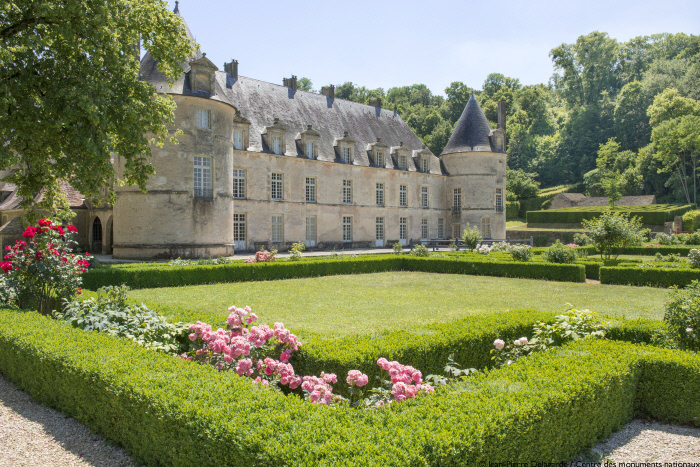 Stroll around the French-style gardens and enjoy views of the château surrounded by moats. Count Roger de Bussy-Rabutin (1618-1693), the cousin of Madame de Sévigné, was a soldier, courtier and famous writer. He was exiled from court after exposing the love affairs of his famous contemporaries in his Histoire Amoureuse des Gaules. The Count de Sarcus began restoration work in the 19th century and managed to have the château listed as a historic monument in 1862, the first instance of State protection for private properties. It was bought by the French state in 1929 and extensive restoration work has been carried out since the 1970s. Bought by the French state in 1929, the estate has undergone extensive restoration work. Listed as a "Remarkable Garden", the magnificent grounds were restored in 1990 in the 17th-18th-century style. They feature water fountains, cabinets de verdure (formal "rooms"), a maze and groves demarcated by alleys in a star formation. The terrace is decorated with flower beds bordered by shrubs, old varieties of rose bush, tree peony and vibrant flowers. Statues of mythological figures complete the landscaping. The grounds also have a bee hive, icehouses, a dovecote, an orchard and a kitchen garden where old varieties of vegetables are grown. "Bussy... is magnificently built and the interior is of a singular beauty that cannot be seen anywhere else" "...you can find such wonderfully amusing things there". - Roger de Bussy-Rabutin. Extract from his correspondence.